Having coached many double-handed teams, mainly in the 470, I420 and C420, to podium finishes in World and Continental Championships, as well as literally hundreds of teams at regattas from Olympic training events to small local regattas, I’ve seen time and time again that the work of the crew is critical to ensuring a team’s success. 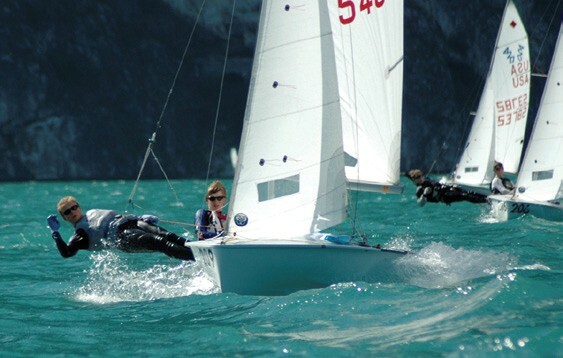 There are several key components to becoming a good dinghy crew: understanding the mechanics of what you need to do in the boat, filtering the information that comes into the boat and using it to make the correct decisions both strategically and tactically, making sure the boat is always moving at full speed, communicating clearly with your skipper/teammate, and developing safe, efficient trapeze skills. Let’s address the mechanics of getting out on the wire quickly and with the correct technique. 1. Place your forward hand on the donut (handle) with your fingers wrapped around the coarse adjuster towards the stern. 2. With the jib sheet in your back hand, put your hand over the gunwale with your thumb pointing towards the stern and your fingers wrapped around the gunwale. 3. Push off either the floor of the boat or the center case with your back foot to allow your front foot to get to the gunwale first. This is essential to maintaining stability. 4. Provided there is enough pressure in the rig, keep your front arm straight. 5. Place your back foot on the gunwale, with your feet shoulder width apart. 6. Keep both legs straight. 7. Place the jib sheet in your lap and then use your backhand to clip the trapeze ring into the hook on the trapeze harness. 8. Trim the jib to the desired shape. 1. Provided there is enough pressure, you must go out on the side of the boat with your arms and legs straight, which will provide the boat with maximum leverage and allow it to accelerate quickly to full speed, rather than wasting that energy if the boat heels too much. 2. You should be able to reach your donut from your full trapezing position. If you can’t reach it, lengthen your coarse adjuster to bring the donut closer to the hook. 4. Rotate your body towards the bow. With your forward hand behind your head, imagine that you want to take your forward elbow towards the water. This will allow you to look forward to see the jib, see the bow to monitor fore and aft trim, find puffs, lulls and waves that are coming onto the boat, and locate the next mark. 5. If you find you are falling backwards, push off the helmsman’s forward shoulder. 6. Do not sit on the side of the boat to trim the jib and then go out on the trapeze because it’s a slow way to maneuver that will result in loss of boat speed. If you hold the jib sheet in the same place as when you picked up the jib sheet on the other side of the boat, you will naturally pull the jib in as you move further away from the leeward jib cleat. 7. Standing on your toes on the gunwale will effectively make you taller, which provides more hiking leverage and enables the boat to travel faster. 1. Reach for the donut with your forward hand, keeping your arm straight. 2. Lift your hips up towards the sky; releasing the tension on the bungee attached to the trapeze ring will unhook the ring. 3. Come back into the boat with your back foot first. 4. Place your backhand on the gunwale behind your back leg to increase your stability. 5. Bring your front foot into the cockpit behind the trapeze ring bungee; otherwise you will become tangled with the bungee. 6. Depending on what your next maneuver is, your back foot will either go onto the windward side of the cockpit or the leeward side of the cockpit. Minimizing steps in your maneuvers will allow your maneuvers to become smoother and you will be able to complete them in less time. If you find your skipper tacking while you’re still on the wire and you don’t have time to unclip, the chances of capsizing are great. First off, don’t panic. Once you’re in the water, the method to release yourself from the trapeze ring mentioned above will not work. Instead, you need to put one hand on your donut and then take that hand towards your belly button. This will allow the bungee to work and the trapeze ring will release from your hook. You can use your free hand to help clear the ring if needed. Once you are free from the trapeze wire, move towards the leech of your mainsail. DO NOT go towards the mast, as there are many lines you can become entangled with.